Shows begin April 17th. More info here. I am flattered and humbled by this recognition from the editors of Vanish, a magazine for magicians. I had a blast performing and lecturing at The Chicago Magic Lounge this weekend. What a vibrant and friendly community they have built there. The management, crew and staff made me feel welcome. The house performers are first class folks and a blast to be around, the audiences are engaged and full of life and the venue itself is stunning! I can't wait to return. Thanks to Magic Inc for sponsoring the lecture. We had a great turnout and a fun afternoon. I've decided to offer my video lecture notes to everyone who couldn't attend. You can stream them or download to any device over the free Vimeo service. Enjoy! I'm excited to be heading to Chicago in August to perform at The Chicago Magic Lounge. It's a swanky nightclub that features magic and sleight of hand and it's been getting rave reviews from their customers. Can't wait to see the joint! I'll be lecturing there on Saturday afternoon -August 25. Magic Inc is sponsoring the event which will be held at the Magic Lounge at 11AM. More info can be found at magicinc.net. It'll be my only lecture in North America this year. Hope to see all my Windy City buddies there! Lecture tickets and info HERE. I don't think I've ever had more fun performing on stage. This incredible show officially opens tonight in Canberra Australia. It's been a lot of fun but a lot of work to get to this point. What an amazing creative team that conceived, developed and executed this wonderful show. From the beautifully realized costumes by Angela Aaron to the cinamatic musical score by Evan Jolly and ravishing set design by Todd Edward Ivans, it's a magical setting that will transport audiences to another era. Our director Neil Dorward pulled it all together with a sense of fun and inventiveness that tells the story of the circus coming to town in the year 1903. I've met a lot of show people in my day, but these amazing circus performers are cut from a different cloth. Some of them are from sixth generation circus families and the showmanship is beyond astonishing. It's an international cast of artists who are all at the top of their game. Simply incredible talent. And then there are the elephants. Mervyn Millar and Tracy Waller, who were responsible for the amazing horse in War Horse, designed and created these magnificent puppets. They are beautiful, as sculptures they are works of art, but when they move you immediately forget that they are puppets and they become real elephants. It's magical and I don't think people will be prepared for the emotional response they will have to these amazing elephants. Watching from the wings last night during previews I saw a family in the front row with two boys with their mouths literally hanging open throughout the show! No Marvel movie will ever hope to compete with the thrill of actual super heroes of the circus flying through the air right in front of you. There are so many wonderful moments in the show. It's thrilling and funny and sweet and sometimes a little scary. Thank you to producers Simon Painter, Andrew Spencer and Tim Lawson for inviting me along for the ride. I met two teenagers who challenged and changed how I think about the art of magic. I met them each separately and decades apart but I recognized similar qualities in each of them. They were both at a skill level well beyond their years and in both of them I saw a passion and a seriousness and an intensity that I had not seen in other young men their age. In hindsight I suppose I had glimpsed the artists that they would become. I remember that I was instantly drawn to both of them and felt, in one, a fraternal bond and in the other, a paternal affection. Recently, decades later, I saw them each perform an evening of magic and story telling in two very different shows and two very different styles and my very first impressions of the young men I met were confirmed. They had each bloomed into wonderful artists with uncompromising visions of how the art of magic could be interpreted. In 1976 eighteen year old John Carney stopped by Dayton, Ohio to lecture for a small group of IBM Ring 5 members. It was held in the home of Dr. Kitain, a dentist and amateur magician. I was fifteen and had a growing interest in close up magic fueled by the libraries of Dr. Kitain and "Doc" Smith, another local dentist/magician. I knew who Vernon was and only recently learned about Marlo. Up until that point I'd seen terrific close up magicians at the few conventions I was able to attend, but I wasn't prepared for John. By then I had witnessed, at best, very competent magicians perform complicated and difficult routines that sometimes fooled me, but none of it felt like real magic, until that night in Dr Kitain's living room. Coins melted away in his slow moving hands. Cards changed colors as he casually fanned the deck. What was I missing? I didn't see any tells or "moves," no clenching of the hands or bunching of the shoulders I'd learned to watch for. His easy smile and his non-combative manner threw me completely off guard. His innocent attitude and easy manner lowered my defenses and he was able to slip methods and maneuvers in that I had no chance of catching or even suspecting. My head was spinning, magical effects were happening inches from my nose and I had no idea what was going on. This friendly Midwestern teenager effortlessly wiped away all of the preconceived notions I had built up about how magic could be performed close up. I was stunned and disoriented, especially because he was not much older than me. The other kids my age were still trying to be either David Copperfield or Doug Henning. Or both. And then he began to explain. He taught the secrets to the routines and the fine touches on the sleights, but more importantly he taught basic lessons in timing and misdirection. He taught the importance of naturalness of action and motivation of each movement. These were new ideas to me at the time. He spoke about his mentors, men like Fawcett Ross and Dai Vernon. Roger Klause and Charlie Miller. High priests in the church of naturalness. I was converted that night. Turns out he was a great teacher at eighteen as well. I'm happy to say that we stayed in touch and became friends. We've shared ideas and methods over the years. We've, in turn, celebrated and lamented the ups and downs of our careers over the years and had many, many laughs. We've cheered each other on and dared each other to climb higher. I've always felt that John was my magical big brother. He was always a role model for me, an example of how to behave on and off the stage. I've watched him grow and have always marveled at his work ethic and his search for the better, higher path along the way. His never ending search for better, cleaner methods and his amazing range as an actor and comic. A few weeks ago I sat in a small theater in Seirra Madre, California and saw, for the first time, John's one man show. Forty years from the night we met and the same feelings of awe washed over me during the performance. Here was that same friendly Midwesterner effortlessly tossing off miracles while employing some of the most difficult techniques with such ease. And it was all wrapped up in a such a disarmingly charming presentation that the audience had no chance. I sat there thinking "It just doesn't get any better than this." A lifetime's worth of study and practice was on display. You don't often get to see a true master work at the top of his game. It was also a piece of theater. John's loving portrayal of his slightly eccentric magic mentor Fawcett Ross was a sweet glimpse into John's earliest influence. When he slipped on the cardigan and placed the pipe between his teeth we were transported to Fawcett's living room. Then just as easily he slipped into another eccentric character, the ridiculously self-deluded Mr. Mysto! I'm proud to say that I was present at the birth of Mr. Mysto many years ago when John stepped out on stage portraying a mamby-pamby egomaniac with a goatee at the Washington DC convention. All in attendance were in stitches by the end of the night. I don't know any one else on this earth with John's acting chops, sense of humor and sleight of hand skills. Add to that his smart and funny writing and ingenious methods, borne out over decades of trial and error and the whole package is irresistible. My son, Ben was with me that night in Sierra Madre and I pointed out to him that he was witnessing one of the greats. But he already knew that, he saw me beaming with pride watching my old friend and glowing with love for my magical big brother. In 1998 I stepped into a magic shop in Colorado Springs and the fourteen year old kid behind the counter snapped his head up from his cards and he stared at me as I moved around the shop. I knew I had been recognized. 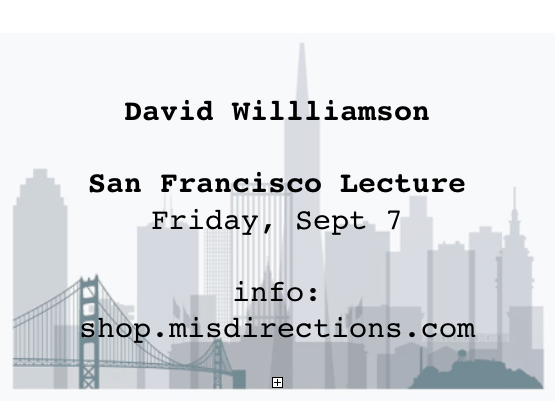 "You're David Williamson." "Yes, I know, who are you?" I asked him to show me something, and he did. That same feeling I had in 1976 returned as I saw this young man display sleight of hand skills way beyond his years. Derek demonstrated shuffles and deals and techniques that I was still trying to get a handle on at the age of thirty-seven! The easy execution alone told me that I was in the presence of a highly skilled operator, but it was the intensity, the fire in his eyes that made me think that I may have just met another prodigy. Even though he was well on his way to advanced levels of ability, he had that thirst for knowledge that I recognized. Over lunch I learned more about his life at home and a little of his hopes and dreams. A bond was formed. He came to see my goofy show that night for a bunch of insurance executives, and for a few years after that we met again at the same annual event. I got to see Derek less and less over the years but I followed his progress from a distance. He moved to LA and entered acting school. He found friends and comeraderie at the Magic Castle. He was running with the big dogs in the gambling underground. He dabbled in casino card play and corporate gigs. But he never seemed satisfied with the perceived paths most of us followed in magic. TV, clubs, corporate dates, Vegas all seemed like dead ends to Derek by a certain point. At least that's the impression I got after a phone call from back stage at an east coast night club. "Is this all there is?" Then, a few years later I met him again in LA for a sandwich. Here was a different person. His eyes glowing, ideas flowing after meeting his artistic counterpart, Glenn Kaino, for the first time. Glenn is a very talented conceptual artist. He spoke a language that Derek understood. I think at that lunch I witnessed the beginnings of Derek's new vision of what magic could be, and what being a magician means. I was concerned that day, I thought he was on drugs because he was speaking a mile a minute of concepts that I could barely grasp but he had to explore. And he did, in many formats and in fits and starts in galleries, and performance pieces on both coasts. Was it art or magic, or something else? His buddy Helder from Portugal joined him to create a ground breaking show with some thought provoking moments establishing his bonafides in the theater world, where Ricky Jay had paved the way. 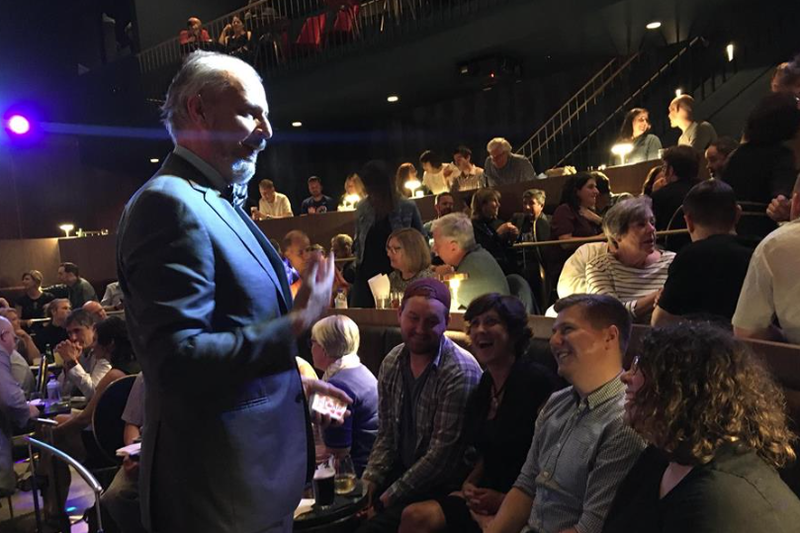 Last week in a small theater in Westwood Village in LA I witnessed the culmination, so far, of Derek's search for what it means to be a magician. I couldn't tell you how any of the "effects" were achieved because I have no idea. The story he told was personal and the show hit me with an emotional punch. Here was that same intense young man performing real magic, with real meaning to many of us and I was drunk with pride and love for this kid. My son Ben was with me again, and he saw me burst into tears at the end of the show. I saw a wonderful clip of a young man performing magic on the Ellen Show recently. He was really charming and funny and even though his execution of the trick and his technique left a bit to be desired, his incredible enthusiasm won the day. The best part was watching Ellen crack up at his performance to the point that she was wiping away tears. The other thing that struck me was Ellen’s generosity towards this boy. I’m not referring to the pile of magic props that she gave him as a gift at the end of the segment, although that was very sweet, I’m referring to the kind indulgence, patience and acknowledgement that she gave to his performance and to him. She didn’t use his time to interrupt for the cheap laugh or to put the spotlight back on herself, she gave him the most precious gift we can give to any child, she gave him her attention. She let him shine, and he did! When I was his age I didn’t have a fraction of the bravado that this kid displayed, but my enthusiasm for magic was at least equal to his. I was a painfully shy boy who didn’t really seek attention outside my home. But within my family home it was a different story! With two brothers, the competition for my parents’ attention was fierce. Being the middle child didn’t help. When this ancient art form finally found it’s way to me, an eight year old introvert with low self esteem, it spoke to me in a language that I understood. It was as if a hidden doorway had cracked open for me, leading to a whole new world of possibilities. I had found my passion, and (in my mind) my purpose. It didn’t hurt that my fledgling attempts at impressing my mother and grandmother brought out booming gales of laughter and screams of surprise and delight! It was intoxicating to have that response from them and it filled me with warmth to feel the spotlight, the attention... the love of my family upon me. While watching that clip, Ellen wasn’t the only one wiping away tears. I'm thrilled to be joining the cast of The Illusionists Live in London beginning this November for a seven week run at the Shaftesbury Theatre. I had a blast with the show last year in Perth and Melbourne and I'm looking forward to once again standing in a V formation with some very talented performers! Can't wait to hobnob with my UK Magic Mates! I'm so happy to be included among the artists appearing at FISM in Rimini, Italy July 2015. I've always had the time of my life whenever I've attended a FISM convention and this one is looking like it might be the best ever! An interview and performance at the Magic Castle with the wonderful Fitzgerald. Watch Classic Dave Videos Online! In 1990 I snuck into the TV studios of a large corporate entity in downtown Washington DC with producer and cameraman Ken Norris. In the wee hours of the morning we shot several hours of footage, documenting my original routines and handling of classic tricks. I sent the raw footage to my brothers Bobby and Gary who were working as TV and film editors in L.A. They chopped it up and added some gags and vintage commercials and cartoons to make it watchable. Sleight Of Dave turned out to be one of the best selling magic videos of its time. I was always happy to hear how much the magicians who bought the tapes enjoyed the magic content, but I was thrilled to hear that their wives and children loved the crazy footage as well. A tribute to the wacky Williamson brothers and their warped sense of humor. Dave 2 came out shortly afterwards and included more of the routines shot in the studio as well as some footage of live lectures and performances in Colon, Toronto and London. It features the footage from a British show that John Fisher produced called Comedy Magic Strip. This includes the infamous "Murray" clip, where I get one-upped by a smart six year old. Sleight Of Dave and Dave 2 were originally offered as video tapes in 1993 and then in 2003 I produced Magic Farm which was shot at the Williamson family farm with relatives and friends acting as the audience. It was offered as a DVD along with Sleight Of Dave and Dave 2, which were re-mastered as DVDs. I'm proud of the fact that these videos are full of audience tested, real world routines and ideas. I've built a career on the material contained within them, and I'm happy to share it. I'm offering these three classic videos as online streaming products after the release of the RIDICULOUS DVD set that is produced by Luis De Matos. Much of the material overlaps and most of the routines from the classic videos are revisited in the new RIDICULOUS DVD. I'm still fond of the original videos and want to keep them affordable and available to those who haven't seen them. The material and instruction still holds up and I've been told countless times that many of the routines have helped others build acts and careers as well. Check it out here. Wow, David Britland really did a number on me in this month’s Genii Magazine. In the article John Lovick dives into the history of the “Vanished Man” It’s sort of a locked room mystery legend from old magic convention lore. In my youth I decided to re-create the fabled mystery. John has exposed my unconventional method that had folks baffled for years. I’m not sure how I feel about that. Even though I know it's just a big AD for the upcoming DVD set from the amazing Luis DeMatos and his great team, I'm thrilled to be featured in the pages of Genii. This is the magazine that I grew up reading as a boy. I especially enjoyed reading Dai Vernon's articles, he always had something interesting to say about the art of magic and it's history. If you didn’t get a chance to read the article, click here for a .pdf. I’m thrilled to be presenting a night of magic and comedy October 27th at the Axis Theater. The show is to benefit a wonderful program created by the Conjuring Arts Research Center which uses the art of magic to change the lives of deserving youth and disabled.